His rich voice, comic timing and touching anxiety over the blossoming relationship between his daughter Miranda and the shipwrecked Ferdinand make him poignantly humane, as does his evident regret as he relinquishes his power. 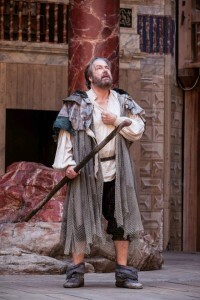 Roger Allam is Prospero. He is so natural that he commands the stage without raising his voice. With his perfect vocalisation – he’s thought about every single phrase he utters – and unforced baritonal melodiousness, he commands the stage as well as the elements (up to a point), before joining in the joyous masque for Miranda’s wedding to Joshua James’s hilarious, posh boy Ferdinand; he trips the light fantastic as well as he speaks it. The great Roger Allam won an Olivier award for his magnificent performance as Falstaff at the Globe and this most versatile and humane of actors is in equally fine form here. Prospero can sometimes seem a testy, tedious old sage but Allam characteristically discovers a great deal of humour in the role, along with piercing moments of tenderness. Allam’s natural ease with Shakespeare’s language opens up boundless opportunities for his character. One minute the audience is treated to a tortured Prospero, quivering with the desire to avenge his wrongful deposal; the next he eases into familiar adoration and affection for his sole offspring Miranda (Jessie Buckley), engaging in a string of sarcastic exchanges which establish the strong but affable bond between the pair. With his arsenal of rolled eyes, awkward silences, exasperated sighs, and helpless looks, Allam finds a novel, funny and very human take on the oft stick-in-the-mud-ish Prospero. 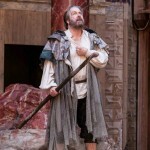 Roger Allam brings refreshing humour to his portrayal of Shakespeare’s vengeful sorcerer. Allam weighs every word exquisitely. He has the ability to make a line as simple as “Fairly spoke” vibrate with meaning — in this case allowing wryness to chafe against humanity. In the capable hands of Roger Allam, Prospero’s accomplishment in the magical arts and preoccupation with revenge seem an almost reasonable approach to his predicament – the way in which he plays the puppeteer is nicely understated. Allam’s Prospero is absolutely steady in its musicality, its stillness, its projection of a wisdom that can contain paradises and purgatories, storms by sea and storms of the heart. Prospero is as much a signature role as Hamlet and Allam conveys the weariness behind the histrionic mastery and the calm to which it will be a prelude. He never milks the language which represents Shakespeare’s late manner at its most opalescent and baroque. But the steadiness of the variations on the iambic pentameter have a music that draws us into the heart of the mystery of this meaning-of-life play. And when Allam does surrender to a barbaric splendour of emotion, the rhetoric makes you realise – as you should with Prospero – the King Lear inside this wizard and playmaker. The moment when Allam breaks his staff – the moment when he drowns his book as an act of renunciation – is executed with a sudden, shocking brilliance.